Our Nation’s oldest city offers an array of activities and amazing sights! From a historical district to sunshine-filled beaches, there’s a ton of things to do for every guest. If you’re like any visitor to our amazing area, you’ll want to jam as much as possible into the time you’re here in beautiful St. Augustine. 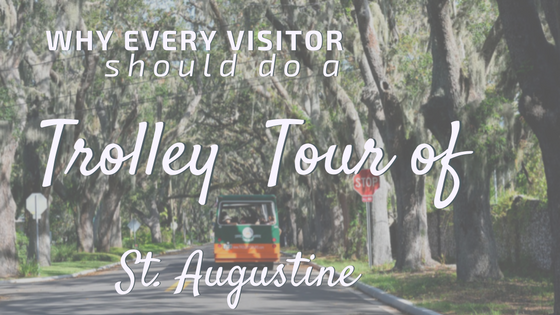 An excellent way to familiarize yourself with the area and get oriented with your surroundings, is to take advantage of St. Augustine’s trolley tours. There are two main trolley tours that service the St. Augustine historic district. Old Town Trolley Tours and Red Train Tours. What’s the difference you might ask? Some folks say that the Red Train Tours are cute because they look like a train and are easier to access for those that need their step into the trolley to be closer to the ground. The Old Town Trolley Tours are said to have a slightly higher step and look more like an actual trolley. They both have their different styled tours, example: the Red Train tour also has a ghost tour which is the black train you see that runs in the evening. So if you want to see some ghosts, give it a try. They also have various packages and perks. Old Town Trolley also has a ghost tour as well, but looks like a type of bus and they too offer different packages. It is best to visit their website to see which style serves you best. By using this convenient service, you’ll cover more ground than you’d be able to on foot, in a shorter amount of time. With unlimited hop on and off privileges once you purchase your seat, you’ll be able to enjoy over a hundred points of interest along the route. The fully narrated tours offer insight into the history and charm of the area, as well as suggest additional activities for later. Each touring company has drop-offs and pick-ups at each marked stop, approximately every fifteen minutes. Be sure to look at the sign and make sure you are at the service stop of the provider you chose and not their competitor. For those of us with fur babies, there are several services offering pet friendly tours . One of my favorite things about the trolley tours is that every tour guide has their own historical fact or unknown history that they like to share. It was one of the tour guides that told me where to find the tile that looks like Henry Flagler at Flagler College, and the story about the love tree across from Mojo’s BBQ. So pay attention to what they have to say, you never know what you might learn. Some great points of interest along the stops are the St. Augustine History Museum, the Old Jail, Potter’s Wax Museum, the Old Drug Store, the Spanish Military Hospital, and the infamous Fountain of Youth. If you’re lucky enough to be visiting our area during a holiday celebration, the trolley tours often add theme experiences, enhancing the tour with fun-filled, holiday related activities. During Halloween, you can participate in a hauntingly fun-filled ghost tour. During the months of November and December, tours of Nights of Lights can be experienced. The trolley tours will enhance your vacationing experience throughout our area. This easy, fun, and affordable portion of your vacation just might become your most favorite memory! So, book your stay with us here at Beacher’s Lodge, reserve your trolley tour, and prepare to have a wonderful vacation enjoying our heritage and culture in beautiful St. Augustine, Florida!